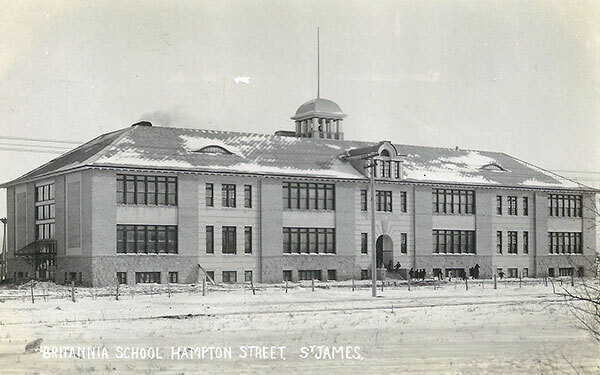 Designed by local architect E. D. Tuttle and built in 1910, the original six-room brick and stone school cost around $65,000 and was officially opened by the Education Minister George R. Coldwell on 6 January 1911. It was subsequently expanded on Tuttle’s designs in 1912 at a cost of a further $85,000, and officially re-opened by Coldwell in the spring of 1913. The enlarged building featured its own 235 feet deep well along with waterworks and sewage system, the latter ending in a large $2,000 septic tank. Other modern amenities included a robust air ventilation system, electric lighting, and a May-Oatway automatic fire alarm system. Further additions and an annex were built in the 1950s and 1961. 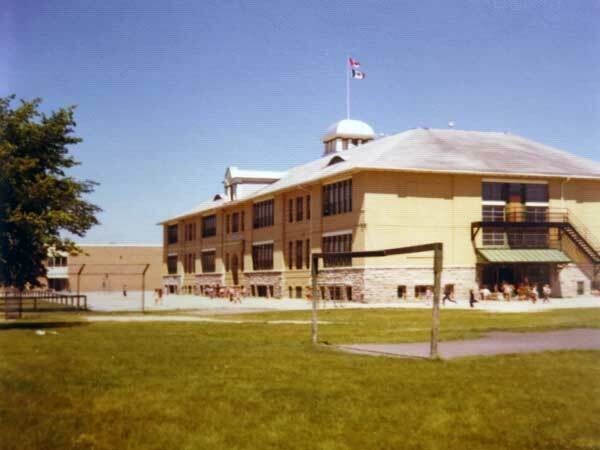 The school became part of the Assiniboine North School Division and eventually closed in June 1979. It was later demolished, its function being replaced by the nearby Stevenson-Britannia School. As of 2013, the annex was still standing and being used as a daycare facility. 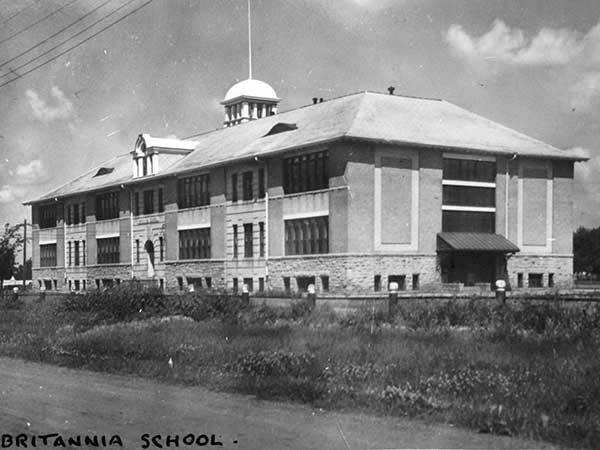 Among the other teachers who worked at Britannia School through the year were William H. Van Sickle and Sadie B. Gillies (circa 1932). Source: Archives of Manitoba, George Harris Fonds, Acc. 1979-141, P7451, Album 14, Page 31. Source: St. James - Assiniboia School Division. “Tenders,” Manitoba Free Press, 19 April 1910, page 2. “Local paragraphs [Britannia School reopening],” Winnipeg Tribune, 13 August 1910, page 5. “Local briefs [Britannia School progress],” Winnipeg Tribune, 27 September 1910, page 5. “Norwood teachers hold convention,” Winnipeg Tribune, 19 November 1910, page 10. “Local notes [A well attended teachers’ conference ...],” Manitoba Free Press, 21 November 1910, page 3. “Local notes [Good progress is being made ...],” Manitoba Free Press, 14 December 1910, page 14. “Britannia School opens tomorrow,” Winnipeg Tribune, 5 January 1911, page 2. “Local notes [The official opening of the Britannia School ...],” Manitoba Free Press, 6 January 1911, page 13. “School trustees’ annual meeting,” Winnipeg Tribune, 8 December 1911, page 11. “Britannia School District No. 1517 - Tender,” Manitoba Free Press, 13 April 1912, page 39. “School work prospers,” Winnipeg Tribune, 4 May 1912, page 9. “Britannia School, St. James,” Manitoba Free Press, 15 February 1913, page 11. “New head of school appointed,” Manitoba Free Press, 2 June 1916, page 19. 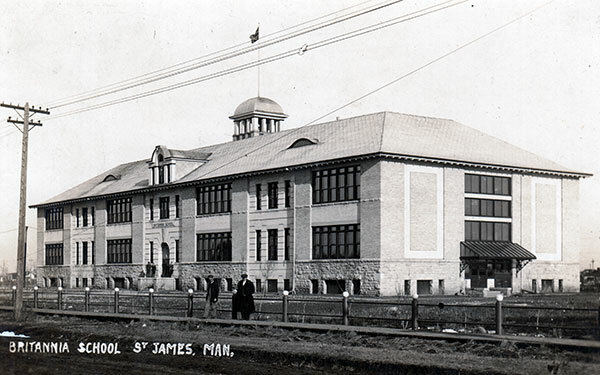 “Address List, Municipal School District of St. James No. 7,”St. James Assiniboia School Division. “Britannia School official opening for Thursday,” Winnipeg Free Press, 28 November 1961, page 3. “It’s Rule Britannia in St. James Friday,” Winnipeg Free Press, 12 April 1962, page 3. “Doors of old Britannia School to be closed at end of school term,” Winnipeg Free Press, 25 January 1979, page 147. We thank the St. James - Assiniboia School Division and Nathan Kramer for providing additional information used here.